The Sanford Lab states that Lead has been called the richest 100 square miles on the entire planet. During its 126 years of mining, more than 41 million ounces of gold and 9 million ounces of silver were taken from the land at the Homestake Mine. 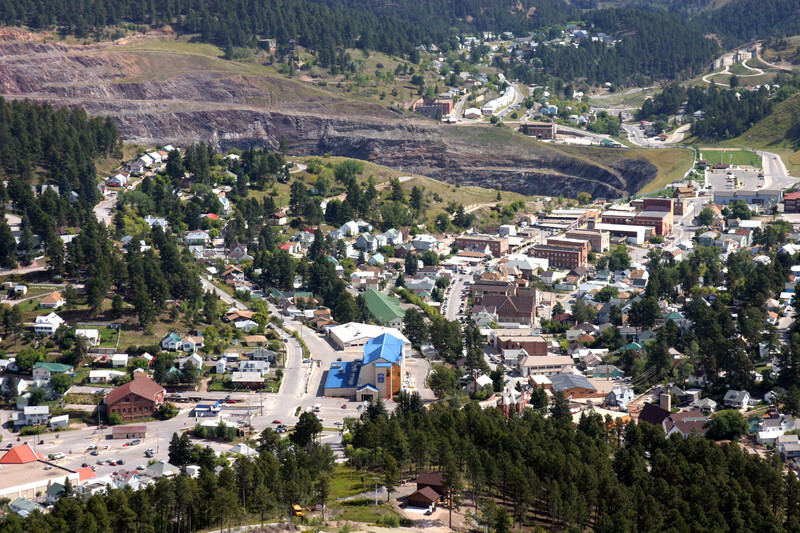 The Black Hills city of Lead (pronounced “leed”) is a cozy and friendly small little town, with a shocking open pit mine in the center. The industrial pit is a stark contrast to the sunny tiny town, but Lead would not exist without the Homestake Mine. Unlike other Black Hills gold rush towns like Rapid City and Custer that have largely abandoned their mining roots, the Homestake Mine was only recently closed and now acts as a groundbreaking scientific research center. Lead was founded in 1876 in the heat of the Black Hills gold rush. Brothers Fred and Moses Manuel and their partner Hank Harney discovered an outcrop of ore, called a “lead”, on April 9, 1876. In their first year of operation, the brothers mined 5000 ounces of gold. But in June of 1877, George Hearst purchased the claim for about $70,000, a miniscule sum compared with the fortunes that would be mined at the site in the next century. The claim was operated by the Homestake Mining Company, and Lead grew as more workers came to the mine. George Hearst’s wife, Phoebe, worked tirelessly to turn Lead into a civilized town. She established the Hearst Free Public Library and the Hearst Free Kindergarten. She gave scholarships to the children of the mine workers so they could go to college. Phoebe also believed in promoting the arts. She helped plan the establishment of the Homestake Opera House, which is still operating today. It was built in 1914 on Lead’s main street. It could seat more than 1000 people and had a wide range of facilities such as a billiard hall, bowling alley, and swimming pool. The theater was nearly destroyed in a fire in 1984, but it has prospered and continues to provide plays, dance performances, tours, and presentations to the community. While the town prospered economically, Lead had more than its fair share of struggles. Being a miner in the late 19th and early 20th century was not easy, with mining accidents like a deadly 1930 mine shaft fire, violence, and rapidly spreading diseases. The 1918 Spanish flu hit South Dakota hard, and Lead was particularly devastated. By December of 1918, it was the number one killer of South Dakotans. The superintendent of the South Dakota Board of Health even announced that public gatherings of any kind were forbidden in any area that the Spanish flu was prevalent. Headlines from Lead read “Seventh Double Funeral has been Held at Lead” and “Fourth Lead Teacher Dies in ‘Flu’ Fight.” The Homestake Hospital was full, so more than 100 patients were housed in the Homestake Opera House. During World War II, mining operations were suspended by an order of the War Production Board. This board sought to expand industries relating to the war effort, while others (like gold) were suspended. Many young miners joined the military or began working in copper mines, which was a metal needed in the war effort. The population of the town plummeted during the war, while the remaining residents worked in the Homestake foundry or machine shop to produce airplane parts, wrenches, and hand grenades. After the war ended, operations began to return to normality.